Standard rooms (av. 22m2) have a Queen, or King or two single beds. All are en-suite with a shower (some have baths) and our guests enjoy a patio / balcony, private entrance, satellite TV, heated floors, microwave and more. Breakfast & WiFi included. Luxury rooms (av. 27m2) have a Queen, or King or two single beds. All are en-suite with a shower (some have baths) and our guests enjoy a patio / balcony, private entrance, satellite TV, heated floors, microwave and more. Breakfast & WiFi included. Spacious rooms (32 m2) with all comforts. King beds, air-conditioner, heated floors, microwave, fridge, tea/coffee facility, safe and convenient work-station. Outside door leading onto deck/patio to the garden. Breakfast & WiFi included. Fully equipped s/c room (av. 26m2), Queen XL or King bed with kitchen (stove/oven-microwave and sink), well stocked honesty fridge, coffee/tea tray, heated floor, fan and satellite TV. Private entrance from garden patio. Breakfast & WiFi included. Spacious room (av. 30m2) Queen XL or King bed with fully equipped kitchen, well stocked honesty fridge, coffee/tea tray, heated floor and satellite TV. Guests enjoy a patio / balcony and private entrance onto the garden. Breakfast & WiFi included. Tasteful room (av. 34m2) King bed with fully equipped kitchen, well stocked honesty fridge, coffee/tea tray, heated floor, satellite TV, plus workstation. Guests enjoy a patio/ balcony and private entrance onto the garden. Breakfast & WiFi included. If cancelling 0 day before arrival, forfeit 0% of the booking total. No bookings after 17:00 for same day arrival and no check in after 21:00 unless arranged prior to arrival. The rate for children under 12 is R200 when in same room as parent/ guardian. Breakfast for children is R60. 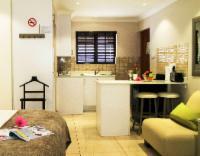 Contact Rivonia B&B directly for current promotions 50% Deposit confirms your booking.